Murgh tikka masala is an easy curry made with ingredients found in most American and British kitchens. And there's a reason for that: it was probably invented in Scotland! Never mind that. 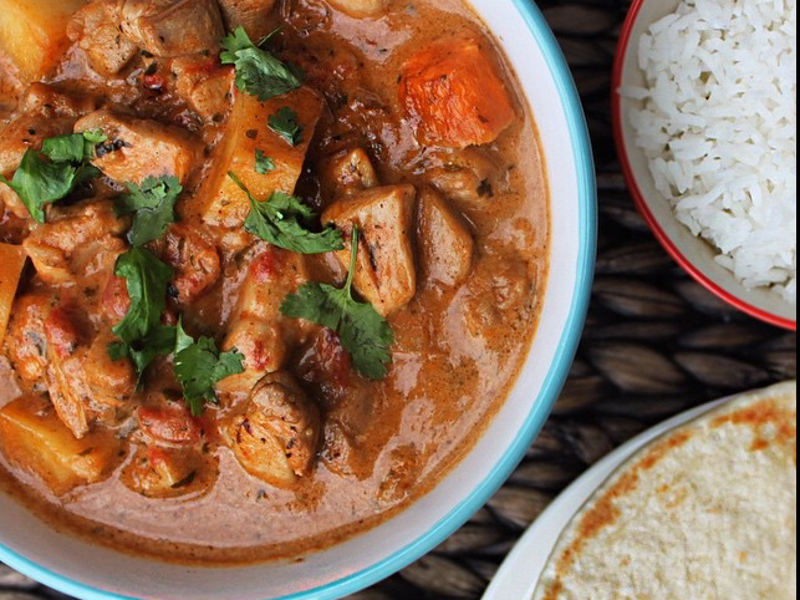 Tikka masala is now popular around the world. Still, many in the U.K. consider this concoction the national dish. The chicken chunks for tikka masala are usually roasted first as for chicken tikka, but this recipe is simpler, and the chicken is just simmered in the creamy tomato sauce until tender. Add the onion, garlic and ginger to a food processor or blender and process until smooth. Add a little water if necessary. Heat the oil in a large pot, wok or kadhai over medium flame. Add the coriander, cumin, turmeric and cayenne and lightly toast in the oil until fragrant, 10 to 15 seconds. Add the onion puree and saute, stirring frequently, for 5 to 8 minutes until cooked down. Stir in the tomatoes and simmer for 3 or 4 minutes. Then add the chicken, water, salt and pepper. Reduce heat to low and simmer, covered, until the chicken is cooked through and tender, anywhere from 30 minutes to an hour. Add more water as needed. Remove from heat and stir in the yogurt or cream, cilantro, lemon juice and a dash of garam masala. Adjust seasoning and serve with pulao or naan bread. For true tikka masala, prepare the chicken as for the murgh tikka recipe and use the marinated, cooked chicken in the recipe above. Add more or less of the spices as you like. Adjust the heat of the dish by adding more or less cayenne pepper. Garnish the finished dish with some toasted cashews or almonds.